I would like to start by apologising for that week long intermission. A sudden spurt of much needed DIY happened and all of my worldly possessions (including records/tapes/cd's were placed in boxes). Thankfully they're all now back where they should be and I am in a position to write again. During the last week I've managed to take a couple of hours off between work and DIY to at least listen to some new music and one such band that caught my eye were Melbourne's Hybrid Nightmares. Unsigned, they've recently release this EP, which is the first of four that are being released in 2015 as part of a concept series. A brave move for a new band, but one that marks out their ambition and belief in their own ability. 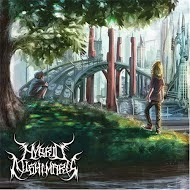 Hybrid Nightmares label themselves as "metal" but as you'll see from this review, they are so much more! Hybrid Nightmares open The First Age with the soothing acoustic guitar of Satya. It reminds me of the first time I listened to “Nothing Else Matters” by Metallica. It has that same spine-tingling effect. HN show that not giving listeners what they are expecting on an EP opener, can work dividends when trying to build anticipation. The howling wind that ends the song leads you straight into Illumination, which is filled to the brim with progressive thrash. The black/death screams sit alongside powerful percussion and melodic guitar. They set out their stall with Illumination, taking the fantasy-filled illusion of 3 Inches Of Blood and the progressive foresight of Coheed And Cambria to a more extreme level. It’s rare nowadays to hear metal that is still metal, with so much genre interbreeding going on. Black Heart takes the traditional heavy metal blueprint and adds flourishes of modernity to it. HN aren’t trying to be twee or indeed copyists, rather they’re playing what they want to and are putting their heart and soul into it. The fact that the very soul I speak of is as black as the song-title suggests, is a happy coincidence. Oh and the lead work towards the end will induce a smile on even the most cynical metal-head’s face. The use of treble and melody in Dead Star Goddess highlights why more bands should forego the atonal gloom that is syringed into today’s sub-genres. I appreciate that it works in doom and sludge, but some of the more interesting releases I’ve heard so far this year benefit because of it. Their moulding of textures and sub-genres make them hard to categorise. Inside ends The First Age with the same gusto that it started with. The musicianship is outstanding, with jazz flourishes taking over from the heavier attack midway through. These five songs are the first of 100 minutes worth of music that will eventually be released as part of the series. If the other three EP’s are as promising as this then we’re in for a treat. If there was an end-of-year list for concept records, HN would definitely occupy the first four spots!